Facing plenty of doubters nationally, No. 11 Florida Gators football will look to maintain its lead in the SEC East as it attempts to win another conference game in its second true road contest of the season. Here’s what you need to know and how you can watch Florida-Arkansas. 1. Respect and relevancy: The overriding theme of this week is a familiar one when it comes to Florida recently. The Gators have rolled through the early portion of the schedule, lost to the “best” team they faced and are now ranked as one of the best teams in the nation with most believing their offense is not good enough for them to deserve such an honor. So Florida hits the road for its first of three tough SEC tests to end the season, this time against an uncommon opponent that it has not faced in three years. A victory Saturday would likely vault UF into the top 10 of the College Football Playoff Rankings. It would also put the Gators one league victory away from clinching the SEC East and a berth in the SEC Championship Game. 2. Continue defensive dominance: Plenty will be made of Florida’s pass rush and secondary stopping Arkansas, but running back Rawleigh Williams III will also be a beast for the Gators to deal with on Saturday. Williams is averaging 5.3 yards per carry and topped 120 yards four times this season. While Florida has also been solid against the run, a couple big plays could open up the entire Arkansas offense, which could spell doom against a UF team still trying to become respectable on offense. 3. 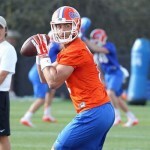 Find some electricity on offense: While the Gators have been able to put some points on the board this season and have been more respectable than the recent past, Florida is still far from efficient on that side of the ball. In addition to relying on sophomores running back Jordan Scarlett and wide receiver Antonio Callaway, the Gators must make a concerted effort to get the ball in the hands of other playmakers, especially guys like junior WR Brandon Powell and freshman WR Tyrie Cleveland. Whether it’s redshirt sophomore quarterback Luke Del Rio throwing short passes or Florida running jet sweeps and pitches, there needs to a premium on giving the ball to guys who can make game-breaking plays as much as possible — not just this week but going forward. And on that note, the Gators always seem to find great success when going to their tight ends — junior DeAndre Goolsby and redshirt sophomore C’yontai Lewis — which needs to be more of a regular occurrence going forward. 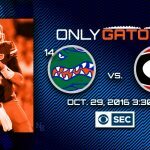 With the line having dropped 2.5 points, there’s especially great value for the Gators as a field goal road favorite against a team that has never beat them in SEC play — particularly when you consider that Florida enters with a top-two defense off a week where all its heard is how little respect it has nationally. The Razorbacks no doubt boast a capable offense that has electrified at times this season, but the Gators have allowed an average of 10.0 points per game over their last three … and Arkansas was just held to a field goal two weeks ago at Auburn. While Florida certainly does not boast an electric offense, Arkansas this season has allowed 41 to TCU, 45 to Texas A&M, 49 to Alabama, 30 to Ole Miss and 56 to Auburn. If the Gators are able to post 24 points, like they have in all but one game this season, they should see a victory on Saturday and the line squeak under the posted total. » Florida is 9-1 all-time against Arkansas with nine straight victories in SEC play dating back to 1995 (2-0 in SEC Championship Games). As such, the Gators are 3-0 against the Razorbacks in Fayetteville. The teams have not played since 2013, and Florida has not travelled to Arkansas since 2008. » The Gators’ defense has been a hallmark of the program; UF is 210-11 since 1990 when an opponent scores 21 points or fewer in a contest, including 15-0 under McElwain. » Also under McElwain, Florida is 15-0 against unranked opponents and 1-5 against ranked opponents. UF is 13-0 when outrushing an opponent, 15-2 when scoring first and 13-1 when leading at half. » Florida’s playing fantastic on third down, converting 50.4 percent of its opportunities on offense (sixth in the nation, first in the SEC) and holding opponents to 28 percent on defense (fifth in the nation, first in the SEC). » The Gators own the nation’s longest streak of returning either a kickoff or punt for a touchdown, doing so in 12 straight seasons. » Florida has the second-most wins in the nation since 1990 (255). Florida will wear white jerseys and blue pants with standard orange helmets. It will be the first time UF has worn one of its most popular combinations since 2013. The team captains, which change weekly, are responsible for choosing the uniforms ahead of each game.